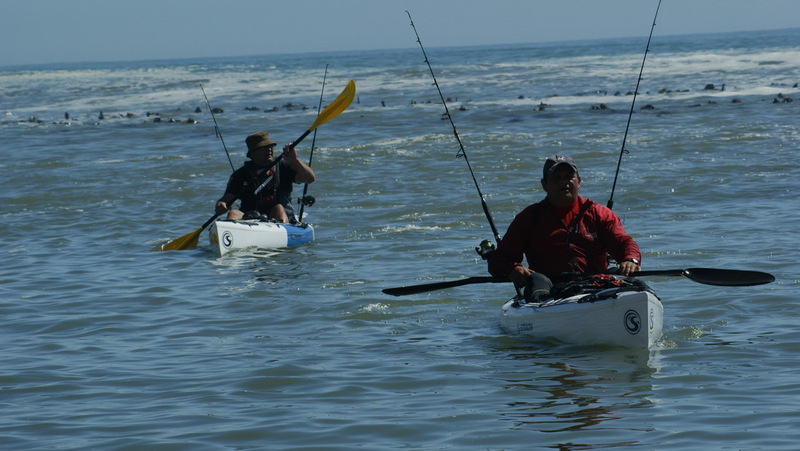 The event was to happen on Saturday 12 August 2017 and from the Southern Cape Kayak Angling Club (SCKAC) 5 representatives as well as an “impact player” who resides in Somerset West were to represent our region. 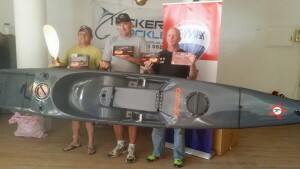 Two from Oudtshoorn, one from Knysna and two MBYBC members namely Jacques Theart and Jauckie Viljoen. 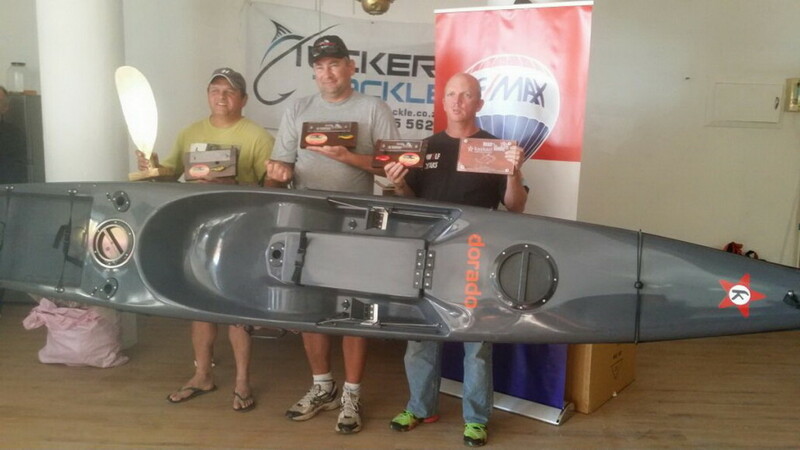 SCKAC sends as many anglers as can make the time and thus these 5 were not chosen. 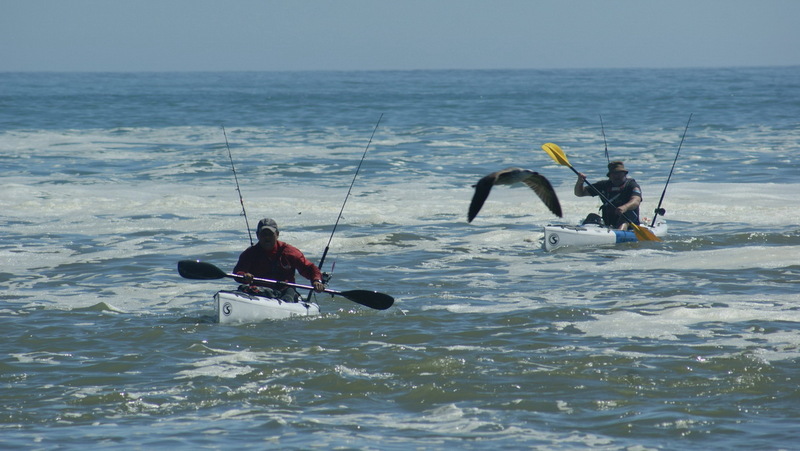 The 12 August 2017 event was postponed by 4 weeks as the weather was such that you could not safely launch at Three Anchor Bay nor safely fish with in excess of 70 kayaks in the big seas that prevailed. 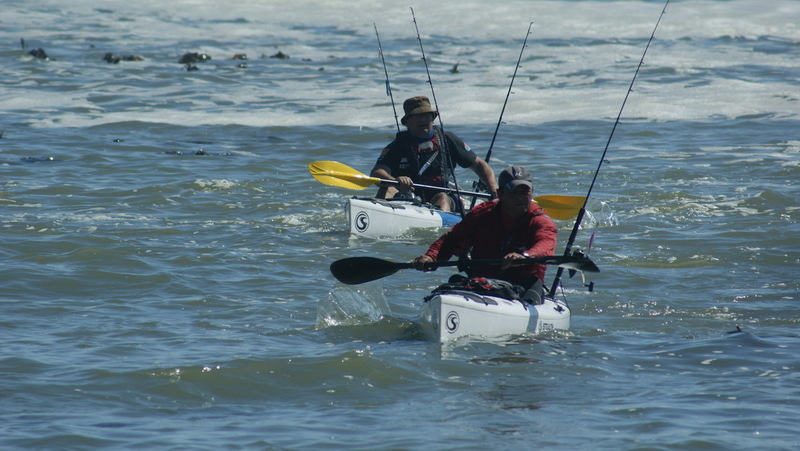 Unfortunately, when the event, rescheduled for Saturday 9 September came around, only the two Mossel Bay Kayak fishermen could attend and took with them the Somerset West fisherman, Rean “Joppie” Maritz as this is a three man person event (ladies also welcome, of course). By the Thursday the weather still looked too heavy for a safe event and the organisers decided to offer the anglers the choice of fishing the Saturday or Sunday 10 September 2017. Two brave fishermen took on the average swells on Saturday and did not catch anything. 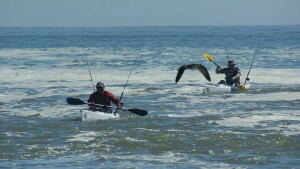 Sunday was perfect weather for kayak fishing and according to the organisers 74 kayaks took part over the two days, 72 from WCKAC and two form SCKAC. The South Cape based team was called War Heads and launched at about 6h45 the morning. The anglers were to target three species namely bonito, yellow tail and snoek. 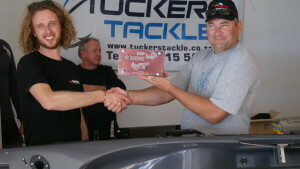 Each angler was alowed to weigh in 6 fish at the end of the event. 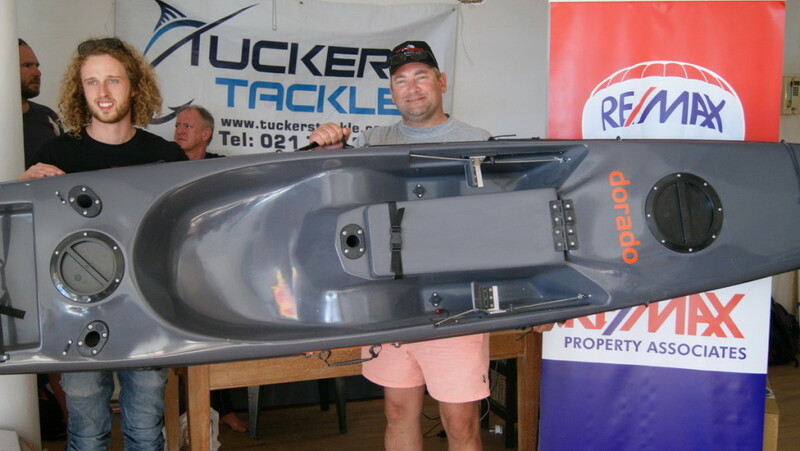 Most WC teams sent one angler after Snoek, one after yellow tail and the third targeted bonito. We saw only about four anglers fishing towards Camps Bay where the whole SC team set off towards. The rest went towards Robben Island where the yellow tail is mostly caught. Joppie had to return to the beach early as he suffered from severe sea sickness without landing any fish. So, the War Heads were down to two anglers with one fish finder between them and Captain Jacques’ knowledge of the area to our benefit. By 11 AM we had three bonito and fishing was very slow. But let me tell you!!! These were BONITO. Uch bigger and stronger than what we get around Mossel Bay on average. We kept trolling further and further away from Three Anchor Bay in 44 m of water and Cape fus eals tracking our every move. By about 12 noon or 12h30 we started seeing Sterretjies working in the distance and kept following them around getting a nice bonnie at more regular intervals. The best time for us was between 12h30 and 13h15 when we often had a bonnie each on the two fishing rods we had per kayak. We quickly got to our quota of ten fish each and then suddenly the fish went off the bite. We started turning towards our home beach of Three Anchor Bay trolling every option we could think of in an attempt to lure a yellow tail or two onto our bait. To no avail. And of cours, by ow we were getting seriously tired. A sow slog with deep divers, which offered much more resistance to our rowing efforts, got us back to the Three Anchor Bay beach by just after 14h00. We had to rest regularly as we were really near exhaustion. On the way back we discussed our chances of being in the prizes as we only got to catch one of the three species and of course the locals had fished a totally different area than we did. And we were sure they knew where the fish were in their “back yard”. As we got near the beach we met more and more returning kayaks and asked how they had done. When they told us that they had barely caught anything, we thought they were just not letting the cat out of the bag for us. When we were on dry land the organisers’ measuring team were on hand to measure our catch and they confirmed that the best scoring team that had weighed in had 4 bonito amongst them. We were elated at the fact that we had a chance. Everybody gathered around while we proudly unhatched our 20 bonito. One late arriving team came in with four really big yellow tail and we thought that they probably had bonito as well. At prize giving it was revealed that we had actually one the team competition. The three of us against 71 WC angers who knew the area….. what were the odds? So we shared the most bonito caught trophy between Captain Jacques and myself with 10 each. Someone from WC got the “Biggest Bonnie” trophy though. And then, it was obviously only Jacques and myself for the “Fisherman of the Day” crown which came with a Kaskazi Dorado (The newest version which was launched recently) and I was lucky to beat Jacques by a mere 3 point. He had 557 and I had 560. That was how close our fish measurements were. On the day the statistics were like this. War heads caught 20 of the 46 fish. War heads received a great hamper of prizes each including fishing tackle, lures, fishing gear shopping vouchers, shirts and fishing caps and lost more. We got home just before midnight, totally knackered but in good spirits and not looking forward to getting 20 huge bonito packed away in the freezer or the early Monday morning back to work reality. We just have to compliment the WCKAC on the way they organised this event. Thank you sponsors for each item sponsored. From me, thank you Arthur of Kaskazi Kayaks. I cannot wait to fetch my customised Kaskazi Dorado from you and taking it out on the water. WE ARE THE KASKAZI WAR ON THE SHORE CHAMPIONS – Well done TEAM WAR HEADS!